A unique and octagonally designed, peaceful countryside guest house and retreat, close to Scarborough offering a warm welcome and bed and breakfast with a difference. 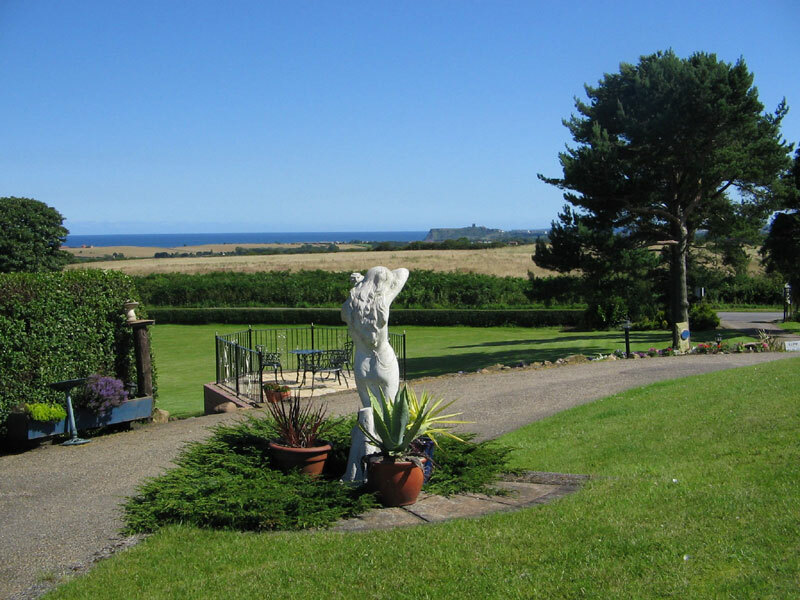 Harmony is totally non smoking and situated in tranquil extensive grounds, surrounded by beautiful 360 degree panoramic views, overlooking the National Park and sea. Our aim at Harmony is to give friendly, personal service during your visit. We can offer attractively decorated, comfortable single, twin, double, or three bedded rooms with en suite facilities, television, radio alarm and complimentary tray. On request we can supply hair dryers and ironing facilities. In keeping with the nature of the house, each room is individually named and has a unique view of the sea or countryside. We have a ‘premises drinks licence’ and so you could relax with a drink if necessary in the guest lounge or enjoy the superb views from our spacious, windchime decorated conservatory. Away from the busy streets and traffic of Scarborough with ample private parking, it is an ideal base for walking, cycling or motoring with easy access to Scarborough, Whitby, the North York Moors and the dramatic North Yorkshire coastline. You can start your day with a full traditional English breakfast or we can offer a vegetarian choice and if given sufficient notice also cater for alternative diets whenever possible. See our Menu details. Please note, due to our elevated location we have 12 low-rise steps into the house. For your comfort and convenience do please make us aware of any special requirements you may need before arriving, and we will try our best to accommodate you. WE DO NOT TAKE CHILDREN UNDER THE AGE OF SEVEN. We are dog friendly and cater for pets by arrangement – see more details. For guests with possible animal allergies we do keep some of our rooms animal-free. Please note though we do have two cats of our own. If arriving by train or coach into Scarborough, a pick-up service can be arranged by prior agreement. If you are coming to Harmony to celebrate a special occasion or you would like to make someone’s visit more memorable, we can provide a bottle of wine, flowers or chocolates in your room on arrival. We can also create a personalised hand made card for the occasion. Please allow us plenty of time to arrange your requirements and advise costings. For guests wishing to have their own space and go self-catering we can offer an attractive, fully equipped 2 bedroom static caravan. We accept groups or families up to a maximum of 5 people. The prices range from £215 to £430 per week, or shorter stays of minimum 3 days from £35 to £60 per day (excluding July/August). These prices include fresh clean bedding, electricity and gas. See more details. Travelling via Scarborough, take the Whitby road and after you come out of the built-up area, Burniston is the first village that you come to. Head north through the village until you see the ‘Rix’ garage on the left. Immediately after the garage turn left into Limestone Road and, following the brown ‘bed’ sign take the second left (still Limestone Road and signposted to Hackness). Harmony Country Lodge is then about 600 metres at the top of the hill on the right hand side. Travelling from Whitby, take the Scarborough road through Cloughton and immediately after entering Burniston, take the first right before the ‘Rix’ garage into Limestone Road and proceed as directions above. Payment can be taken by cash, or debit/credit cards.